A powerful 7.1 earthquake has jolted central Mexico leaving scores of people dead and causing the collapse of hundreds of buildings. Mexico’s Civil Protection Agency has lowered the death toll to 216, the agency’s head Luis Felipe Puente said on Twitter. #Ajuste Hasta el momento se reportan 216 fallecidos: 86 #CDMX, 71 #Morelos, 43 #Puebla, 12 #Edoméx, 3 #Guerrero y 1 #Oaxaca. 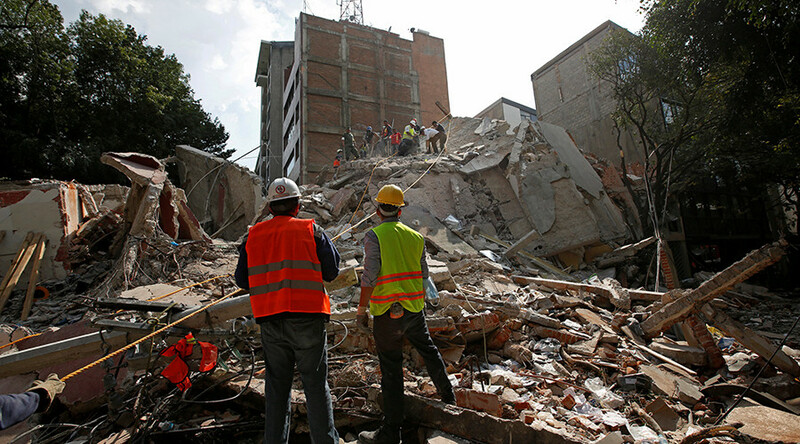 The death toll from Mexico’s earthquake continues to rise, as the National Civil Protection Agency said at least 248 people been killed by the disaster. The biggest losses were reported in Mexico City (117), followed by the state of Morelos (72) and the city of Puebla (43). Casualties were also reported in the states of Mexico, Guerrero and Oaxaca. Mexico’s Civil Protection Agency said that the death toll has reached 226, including 117 in Mexico City. #Actualización, al momento se reportan 226 fallecidos: 55 en #Morelos, 117 en #CDMX, #39 en #Puebla, 12 en #Edoméx y 3 en #Guerrero. The death toll in Mexico’s earthquake has risen to 224, Interior Minister Miguel Ángel Osorio Chong said, as cited by local media. Mexico’s Education Secretary, Aurelio Nuño, confirmed that at least 30 people, most of them children, lost their lives after the elementary school collapsed in southern Mexico City, he told Imagen Televisión. Eleven people were rescued from under the rubble. Nuño added that rescuers aided by volunteers will continue to search for survivors. — Noticiasmx360 (@NoticiasMX360) 20 сентября 2017 г.
Twenty children and two adults died in a destroyed elementary school in Mexico City, Mexico’s president, Enrique Peña Nieto, told FORO TV, as he visited the school. Thirty children remain uncounted for, he added. — Noticieros Televisa (@NTelevisa_com) 20 сентября 2017 г. The rescue operation, which is under way at the school’s premises, is continuing into the night. A total of 11 aftershocks had been registered by 8.30pm local time [1:30 am GMT] following the quake, the most powerful of them measuring 4-magnitude, Mexico’s National Seismological Service reported on Twitter. Major Mexican telecommunications providers izzi, Telcel and mobile telephone operator AT&T Mexico announced on Twitter they were offering free of charge services to help those affected stay in touch.